Verlinde's piano solos explore melodic and rhythmic motives through repetition and variation. His playing smolders with joyful energy and balanced clarity. 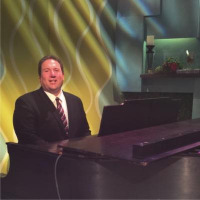 Pianist Eric Verlinde has excited audiences worldwide with his energetic and passionate performances. He is in high demand and is constantly performing, refining the sound and creating new music. His different groups create music that is creative, spontaneous, superbly structured and melodic. Currently, he works with Josephine Howell at El Gaucho, The EntreMundos Quarteto (a Brazilian samba ensemble) and a number of top Northwest musicians. He has played music with legends like: Arturo Sandoval, Randy Brecker, Lee Oskar Eric Alexander, Terell Stafford, Mark Murphy, Luis Conte, Thelma Huston, Floyd Standifer, Buddy Cattlet, Bryan Lynch, Hadley Caliman, Francine Reed, Bobby Medina, Thomas Marriott and Bill Waltrous. Eric has composed more than 200 pieces of music in many different genres, including jazz, gospel, funk, electronic, neoclassical, latin-jazz, rock and R&B, He has published 5 of his own recordings (Peace, What Child Is This?, I Remember You, Daily Grind and Firewalker) and performed on more than 25 other recordings. He has played all over the world, in such places as Paris, Berlin, London, Boston, New York, San Francisco, Los Angeles and Hawaii. Eric has lived in Seattle with his wife Mitzi since 2002. All About Jazz musician pages are maintained by musicians, publicists and trusted members like you. Interested? Tell us why you would like to improve the Eric Verlinde musician page.